Just as Chronic Fatigue Syndrome (CFS) burdens patients and doctors with many indications, evasive causes and lack of a cure, fibromyalgia syndrome (FMS) baffles with its own unbearable constellation of symptoms, ineffective standard treatment protocols and multiple potential causes. Marked by chronic widespread pain, particularly that which does not seem to come from a usual source, along with an increased sensitivity to pain, millions of people (mostly women) suffer with this condition. FMS patients also struggle with severe fatigue, cognitive and behavioral problems, joint stiffness, depression and unrestful sleep. Image by *SHESHELL* from Flickr. Fibromyalgia is an extremely frustrating condition for both patients and health practitioners. It is difficult to diagnose and treat as there are no specific tests or biomarkers for diagnosis. The prescribed drugs are often ineffective and patients report feelings of not being supported by practitioners and the larger community. Doctors demonstrate a large degree of uncertainty when dealing with the illness. Many feel inadequately trained to deal with fibromyalgia and that their patients have difficulty describing their symptoms, and many say that it is difficult to distinguish fibromyalgia symptoms from those of other conditions. Psychiatrists are the least confident among the specialists. The fact that every fibromyalgia patient’s experience is unique makes this condition particularly tricky for all concerned. FMS can be debilitating. For a person with fibromyalgia, feeling “well” may just simply mean that she has the “strength to be involved.” It is common in patients with autoimmune disorders and may in fact be an immunologic disorder. Last year researchers observed that a distinct tissue pathology of shunts in the hands of fibromyalgia patients could interfere with blood flow to the muscles and that it was possible for this to contribute to the rest of the symptoms faced by these individuals. This is an interesting finding contributing to a physiological understanding of the disease. Late last year two studies revealed interesting associations between fibromyalgia and the thyroid, pituitary and hypothalamus. Unfortunately, many doctors still use the TSH test as the primary indicator of thyroid function, which is woefully incorrect. In thyroiditis, for example, an inflamed thyroid causes the symptoms of fibromyalgia. A TSH test may come back “normal” when in fact the patient has a deficiency like low T3. Similarly, patients with autoimmune thyroid disease and hypothalamic-pituitary disorders can display symptoms of fibromyalgia. Dr. Amy Myers focuses on getting to the root cause of fibromyalgia rather than just managing symptoms. She has identified 10 potential causes of the illness, which include vitamin deficiencies, leaky gut, adrenal fatigue, glutathione deficiency and MTHFR gene mutations. FMS is thought to have a genetic component and MTHFR gene mutations are a very important contributor to fibromyalgia. As I discussed in my post on CFS/ME, Dr. Paul Anderson of Anderson Medical Specialty Associates in Seattle found a higher prevalence of these mutations among a group of CFS and fibromyalgia patients than in the normal population, particularly homozygous C677T and compound heterozygous C677T/A1298C defects. Treating these patients with a methylation protocol that included methylfolate, methylcobalamin (B12), folinic acid and a vitamin B complex that contained the active forms resulted in significant increases in positive patient outcomes compared to the standard naturopathic treatment protocol. I’ve provided more details on this in my post on CFS/ME. Like chronic fatigue syndrome (CFS), fibromyalgia is also seen as a condition of mitochondrial dysfunction. Treatment with D-Ribose has been shown to improve symptoms and quality of life in one study. High-dose thiamine has also been found to improve symptoms. Additionally, patients should be checked for elevated homocysteine and heavy metal toxicity. While adequate treatment depends on eliminating the root cause of fibromyalgia, the practices of Tai-Chi, qigong, acupuncture, hypnosis and aquatic physical therapy may assist in the management of symptoms. 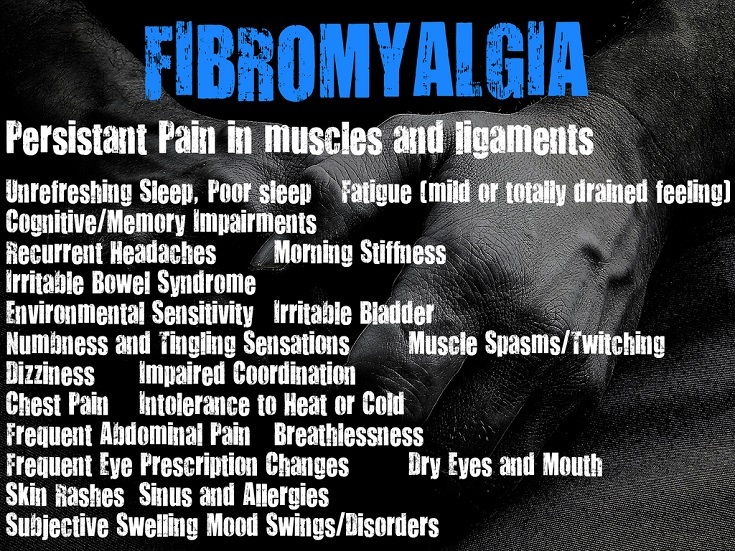 Do you suffer from fibromyalgia symptoms? What have you learned about this condition and what treatments have helped you? Posted by Andrea & filed under Health Conditions. This post has 15 comments. Wow, Wendy, I had to double check to make sure I hadn’t wrote your post. We could be TWINS. Endometriosis, MTHFR, fatigue and extreme body pain and fog. I even have extreme sleep apnea, burning feet and swollen tongue. I too have found the medical profession a complete failure. I do have a few more in my hand though: plantar fasciitis, sesamoiditis, fallen arches, supination, extreme Enviornmental asthma after mould exposure, hernias, and my latest creation were two intestinal polyps the size of duck eggs. I went and got the genetic testing at 23andMe, moved it onto LiveWellO, worked with a naturopath here in BC (Canada), but the issue for me is I keep getting sick and falling off my program. Back into the fog of dragging an exhausted brain dead body through a busy work day. So I am sick pretty much all the time with something – bronchitis is my favourite. During and since (2 years now), I typically get up in the morning, take the CPAP mask off and start my asthma attack. Not by choice. It is an allergic reactive productive horrible coughing attack that results in typically two of three things: Me and the immediate area are covered in asthma slime, I cough so hard I vomit – and just for fun pee myself too. I then typically see stars and look for my ventolin inhailer. Wondering if anyone else has had a). mould exposure and are MTHFR. and or b) has ever been diagnosed with aspergalus asthma.? If so – would love to hear your story. Hi Breanne, I have the same issue! Was exposed to both for the last 7 years and was diagnosed with fibromyalgia 3 years ago. Has anything worked for you? I love your articles! I was diagnosed with compound heterozygous C677T/A1298C a little over a year ago, and I am starting to get really frustrated with the my doctors lack of information and support. Everything I have researched about the condition, my doctor tells me the opposite. I am desperately looking to find another specialist that can steer me in the right direction–do you know what I should be searching for in order to find the help I need in my area? Thank you so much! I have both the A and C mutations for MTHFR. I supplement with Methylguard, per my integrated medicine clinic practitioner, and then I added some supplements due to my own research: betaine, molybdenum, selenium,…and I take the D-Ribose powder with Magnesium “Calm” product, mix both those in water and drink gradually over the day, and I take liquid D drops. I am currently curious about another gene I’ll likely be tested for ( & find out I have): the SUOX gene.I suspect I have it because I cannot tolerate sulfite preservatives, they make my tongue swell, but it doesn’t come up on an allergy test (nothing does!) My tongue has been chronically swollen to the point of extreme sleep apnea most of the time ( 2 sleep studies, C-pap machine but couldn’t tolerate it) & therefore trying a low sulpher diet; eliminating some of the higher sulphur foods like too much of the cruciferous veggies. I added in more squashes & green juices(cuke/kale/parsley, etc. )and am very happy because I think it’s working! The other change is I did my 3rd guided detox diets for a week at a time, because I have high heavy metals( lead,mercury & tin) and those detox weeks have each shifted my health to a better place. I teach yoga 5 times a week, have survived stage 4 endometriosis, and have also survived being called a hypochondriac for decades, as well as depression. My biggest help was the MTHFR diagnosis, the compassionate care leading up to this(at an integrated medicine clinic where my provider communicated with naturopaths who were familiar with MTHFR, as well as chinese medicine, and basically everyone who believed me and/or listened sensitively. Just because the answers are a long time coming….well it’s all the more reason to NEED to hear “I believe you.” But also I have been suspecting the swollen tongue was the key to a lot of this forever, and nobody knew what to do. If I can use an online search engine, why can’t my provider. Just saying. Thanks so much for sharing your journey here, Wendy. Sounds like you have really come a long way! I agree with you that it’s really frustrating when we seem to know more than our practitioners. I am optimistic that this is changing, at least among some practitioners, although too slow for most people’s needs. Fabulous article! I’m still trying to find a doctor to help me with everything taking the non traditional route. Keep up the great work. Thanks so much, Kris – if you need some help finding a doctor, I have a few databases and lists linked to on the resources page. Good luck! I actually had just made an appointment with someone from Dr. Ben Lynch’s site right before you posted this. Someone that had just attended his most recent conference. There are not many options here in Ohio. My NP is working a little with me but not much. I have gotten back to about 75% but seem to be stuck here. I’ll keep working at it. That’s what I do! Have a great day! Can my primary care test my blood for mthfr? If not please tell me of a doctor in the memphis or surrounding areas that can. I went to a hemotologist/oncologist in September of 2014 as they thought I had CML. $9,000 in debt later from genetic testing I’m negative for CML told unsure but it’s just fibro. I have swollen tongue, thick silvia on tongue, rash by joints on my body, breakouts and rashes by mouth, and severe IBS and swelling and CFS. I just completed a 23andme and wonder how I would look for this mutation? My son and I have all of these symptoms and issues, however, I am just finding this information. I don’t know where to begin?